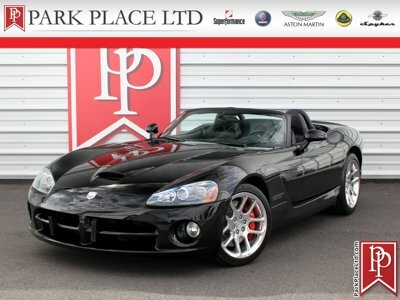 Find a great sale price on this 2003 Dodge Viper at Park Place Aston Martin in Bellevue, WA. This 2003 Dodge Viper is located at our dealership in Bellevue. If you're looking for a great price on this 2003 Dodge Viper or just looking to get an auto loan for the vehicle you want... you've come to the right place! Park Place Aston Martin. Low-mileage two-owner 2003 Dodge Viper SRT-10 Roadster. Viper Red / Black, Black Top, 8.3L V10, 6-speed manual, sport suspension, limited slip differential sport seats, 6-disc CD changer, Alpine speakers. $83,795 MSRP. The Dodge Viper truly is one of the last analog sports cars, with a massive V10 under the hood and not much in terms of electronic nannies. The 8.3L V10 is tuned to develop 500hp / 525lb-ft of torque and send it to the rear wheels through a 6-speed manual transmission and limited slip differential -- just as a proper performance car should. A performance SRT suspension is standard alongside the 18" front / 19" rear wheels. No blinded by sheer performance, Dodge outfitted the Viper with a cabin that features a fair amount of comfort amenities. Leather & suede upholstery come standard, along with air conditioning, power windows and even power-adjustable pedals. Further standard features include xenon head lamps, AM/FM radio with 6-disc CD changer, Alpine speakers and a black top. Included with the car are owner's books, two sets of keys, a CarFax history report and a copy of the Park Place LTD Service Center inspection.